For more than 700 years, Christmas markets have been an annual event in German city squares. The tradition started with 15th-century farmers selling goods in the weeks leading up to December 25. More vendors joined as the markets gained popularity, and now a typical German Christmas market also includes booths selling traditional European food and drink and a variety of ornaments, crafts, and toys. Markets have become an annual event in German cities both big and small, and larger cities like Berlin, Hamburg, and Cologne even have several markets each. Christkindlemarkets across Germany welcome millions of visitors each year, and many of those visitors come from neighboring areas and countries. For example, only about 50 percent of the visitors to the Munich Christkindlemarket actually live in Munich. The popularity of these markets has expanded to other countries. Several British cities host German markets, and there are even markets in Osaka and Sapporo, Japan. The markets in North America offer different varieties of traditional European food and gifts. But no matter what market you visit, expect to see plenty of steaming mugs of glühwein (mulled spiced wine). Right outside of Philadelphia’s city hall, you’ll find Christmas Village (pictured above). The more than 80 booths include German vendors selling Christmas decorations, classic dishes, and traditional sweets. Check out the schwibbogen (Christmas arches) at Kaethe Wohlfahrt, grab a bratwurst with sauerkraut from Brauhaus Schmitz, and treat yourself to spekulatius (spice cookies) from Uebel & Sachs: Lebkuchen. Daily performances from local choirs, bands, and solo artists take place at the market’s central stage at 1pm, 5 pm, and 5:45pm. Sundays are family fun days, complete with hot chocolate, a face painter, and a balloon artist. In the shadow of Denver's Daniels & Fischer Clock Tower, 20 vendors set up shop in wooden fachwerk (German for timber framing) booths. The Denver market has a variety of vendors from all over Europe. Gifts from Afar from Kharkow, Ukraine sells wooden Santas, hand-carved wooden toys, and amber jewelry; Styria Bakery sells Austrian breads and pastries; and Firma rieder Frotscher travels from Jößnitz, Germany to sell German Biersteins. Other booths include wares from Holland, Poland, and a few local Denver retailers. Tip: Stop by the information booth to enter the raffle to win two roundtrip tickets anywhere Southwest Airlines flies. It's $5 a ticket or $20 for five. 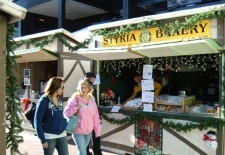 The Vancouver Christmas Market specializes in German and Bavarian food and beverages. This year combines popular favorites from past years as well as 20 new vendors for a total of 45 booths showcasing handmade crafts, gifts, and traditional delicacies. There's Bavarian weisswurst and leberkas (meatloaf) from Juergen Burkhardt, Swiss raclette from Dussa's Ham and Cheese, and feuerzangenbowle or “fire tongs punch," a traditional German alcoholic drink with a sugar cube flambéed and dripped in mulled wine. The market will also feature traditional Christmas decorations, including handmade Lauscha glass ornaments, wooden crafts from the Erzgebirge region of East Germany, and German steingut (stoneware), the most common material used for beer mugs before the introduction of glass. Every Tuesday is Kids' Day with special activities on the kids' stage, children's performances, and lantern parades. Also for kids, jump on the Christmas Carousel for $3 a ride. Location: Queen Elizabeth Theatre Plaza, 649 Cambie St. Tip: Feuerzangenbowle and glühwein are served in reusable mugs, which cost an additional $3.90 ($4 Canadian) on top of the beverage price. When you leave the market, you can keep your mug as a souvenir or return it to the Mug Return Booth at the Christmas Carousel to be reimbursed. For the 16th year, Christkindlmarket Chicago brings its red-and-white striped wooden huts to Daley Plaza, inspired by Christkindlmarket Nuremberg, Germany from 1545. Sixty-five percent of this year’s 50 vendors are German and sell wares such as traditional German nutcrackers, cuckoo clocks, beer steins, and Hummel figurines. Eat and drink from one corner of the market to the other; from sauerkraut to potato pancakes to waffles to currywurst, there's something appetizing for everyone. Wash it down with glühwein in the boot-shaped souvenir mugs, decorated with the market's logo and year. Heated tents and indoor cabins such as the Lufthansa Festival Tent and Timber House provide a place to warm up and meet friends before braving the Chicago cold to wait in line for schnitzel. Location: Daley Plaza, 50 W. Washington St. Tip: Every day, stop by the Advent Calendar at the main stage in front of the Timber House for a chance to win a gift provided by one of the market's vendors.